In just a couple hours I am about to go off to help with a cake walk, hosted by the Friends of the Center for Families, to raise money for the Center for Families, the organization where I worked for several years. Being the good samaritan I am, I decided to make both cupcakes and a cake. But since I spent a good chunk of yesterday running around (seems to be the theme of my life lately) I decided to be lazy give myself a bit of a break and make them from cake mixes. To assuage the slight twinges of guilt I felt from not baking from scratch, I felt I needed to jazz them up a bit and make them at least look pretty. After standing in the cake aisle for about five minutes, staring at the various sprinkles, frostings, icings, and assorted other decorating items, while mentally kicking myself for not thinking to make a Pinterest inspiration board before venturing over to the grocery store, an idea popped into my bead. I know! I will decorate a cake with our logo. I am so clever and I will have the best cake ever! Not too hard, right? I bought some blue and yellow Cake Mate crystals and went on my merry way. Thankfully, after excitedly telling Sam my brilliant cake-decorating idea, he encouraged me just to do people part of the logo and leave out the words. Yeah, that makes more sense. I don’t want to make my cake-decorating too complicated. So last night, after already baking and decorating the cupcakes and making a poster cause our professional-looking banner I was supposed to get printed was not quite done, I set out to make the best cake-walk cake ever I decided I would make a stencil out of wax paper so the people would come out just right. I mean, how hard could it be to make this relatively simple logo in these tiny, sparkly crystals? How hard could it possible be to decorate with these things? Well, let me tell you, unless you are secretly Martha Stewart, leave the cake decorating to the professionals. Try as you might, at 10:00 pm at night you are not going to magically develop incredible cake-decorating abilities. 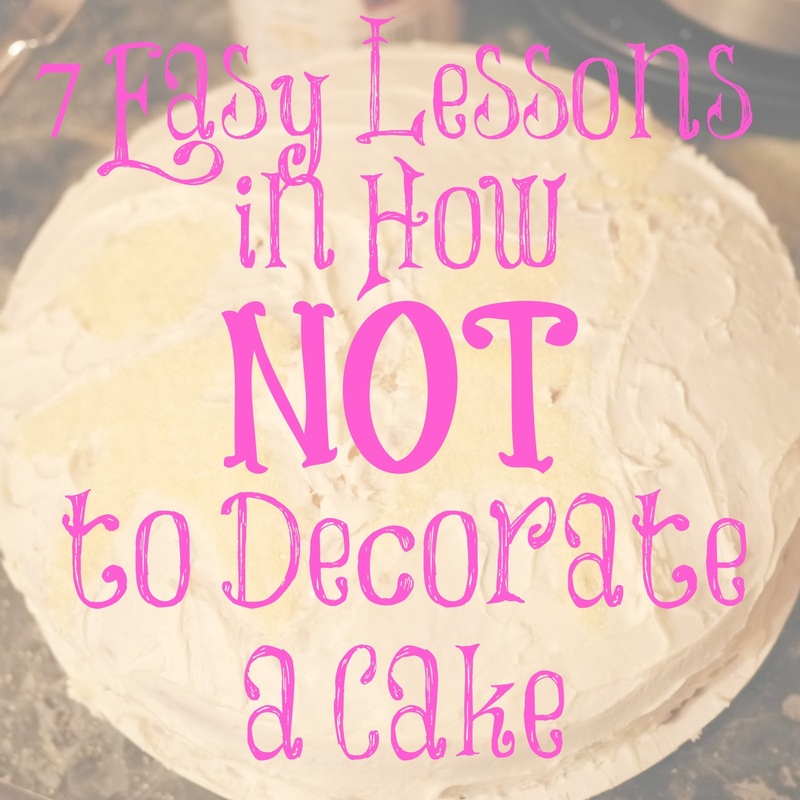 So, dear readers, I leave you these simple tips to help you make sure your adventures in cake decorating is just as (un)successful as mine. 2. Spend 10 minutes meticulously smoothing out the frosting on the surface of the cake and then stick a wax paper stencil over it. You will ruin the beautiful smoothness and curse yourself for that wasted energy. 3. Lick the frosting off the knife when you are done frosting the cake. Inevitably you will realize you will need said knife after you pull off half the frosting when removing the stencil and will end up dirtying another knife and/or have frosting that you can no longer use can your saliva is now in the leftover frosting (don’t worry, I only accomplished the first part). 4. Use crystals and shake them all over your cake. They will get all over your counter and underneath your microwave and on the floor, and inveitably those sprinkles will stick to the bottom of your socks as you frantically run around your kitchen trying to finish up cause all you really want to do is go to bed. 5. Realize at 10:15 pm you don’t have anything to put the cake in. You will not be happy with yourself, will yell at your husband to stop playing that damn video game and help you find something, and you will end up using a coveted giant piece of tupperware normally reserved for storing brisket at the Jewish holidays. 6. Take a picture while in the middle of frosting the cake to record the disaster beautiful moment. You will get frosting on your nice expensive camera and will have a momentary freakout. 7. Put a yellow logo on a white frosted cake. You will barely be able to see the design and all your hard work cutting out the stencil will be for naught. You can sort of see my decorations, right? Right?! My one cake-decorating do: Just go buy one and save yourself the hassle. 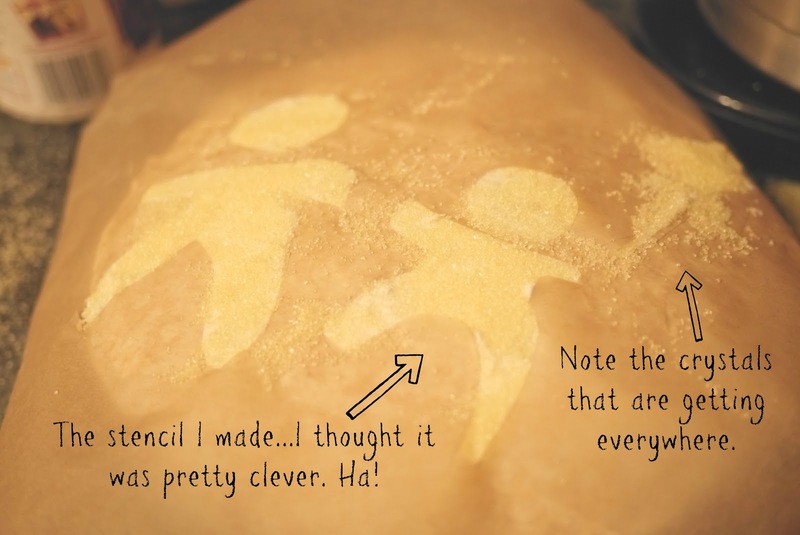 You can totally pretend you made it an everyone will be super impressed with your cake making abilities. What’s your greatest (or not so much) adventure in baking? Wow! That was a rough learning experience. Thanks for sharing it with us so I don’t have those stupid crystals all over my kitchen. What I can see of the logo looks awesome, though. HA HA HA!! This post is awesome! Love it! I totally laughed out loud…those stupid crystals are like glitter…they get EVERYWHERE! Yeah, I might not use those crystals next time, though they are mighty pretty. Hope you have a wonderful weekend as well! I like your style! Excellent baking tips. You should start an anti-baking pinterest board! Oh my gosh, too funny. Stopping over from the Saturday Sharefest. I’m baking my first ever cake from scratch for my sons second birthday in a few weeks. We splurged and bought one last year…let’s hope I can learn a thing or two from this post!! LOL. I might be better off doing that next time, or just stick to cupcakes. I can so relate. While I can cook and I can bake ‘some things’, cake has never been my forte. Well, at least not ‘cakes with icing’. I did such a bad (read: stupifyingly horrific) job at baking a cake for my husbands surprise birthday party one year that my friend sent her husband out to buy me another while I was out with husband distracting him from party that awaited. It was pitiful. It deserved to be replaced. Aw, at least you tried! I have learned to stop trying to make brownies.They NEVER seem to cook properly for me, even the kind that are already in the pan and you just have to stick in the oven! My first attempt at a “real” cake (read as “a two layer, round, decorated cake as opposed to a single layer, still in the 9×13 glass pan with frosting just smeared on it”) was for my fiancée’s birthday. He LOVES Iron Man, and I decided the Arc Reactor would be simple enough. I had to keep explaining to everyone what the hell it was supposed to be.